Darren Young was pleased with his side after they took a point from their trip to Airdrie. East Fife were worthy of all three points in Airdrie, but the one they did pick up could prove to be crucial. 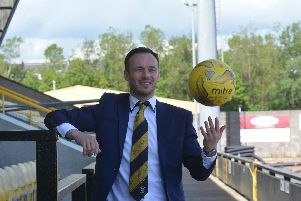 Both Saturday's hosts and Montrose have been breathing down East Fife's neck in recent weeks, with the Fifers' advantage whittled down to just goal difference ahead of the 3pm kick off. But with Mo losing to Arbroath, and Airdrie unable to beat East Fife at home, the side has a bit of breathing space again. Airdrie were unable to get the win they needed against the Fifers, and fingers will be crossed that Montrose suffer likewise next Saturday. Only one side deserved the win at the Penny Cars Stadium, but for all their dominance, the Fifers just lacked that cutting edge in front of goal. David Hutton had to be off his line quickly with barely a couple of minutes gone to snuff out Kevin Smith's route to goal. The early chance gave false hope that the first half would see plenty of opportunities, with little else of note happening in front of goal. In fact, the only real talking point of the half came when boss Darren Young was sent to the stand by ref Steven Reid after blocking Scott Robertson's path while he tried to take a throw in. Young thought the Airdrie defender was guilty of stealing a yard too many with Robertson responding by shoving the Methil gaffer. The second half was a much brighter affair and belonged largely to the visitors. Aaron Dunsmore, Smith, Anton Dowds and Scott Agnew all failed to hit the target as East Fife dominated. Airdrie only really had one chance in the second half, and what a chance it was. A long through ball was misjudged by Chris Higgins allowing Leighton McIntosh to scamper clear on Brett Long's goal. Recent East Fife managers - how do their win records stack up? The Fife goalie closed down the angles, but left his goal gaping behind him. McIntosh tried to lob the ball over Long but completely fluffled his shot, knocking it harmlessly into the keeper's arms. Following the game, boss Young said: “We passed it brilliant but they defended their box very well. “It was good to get the clean sheet, keep Airdrie away from us and go a point clear of Montrose. “We now look forward to next week’s game."